Whenever I go to a hearing on the Senate side of Capitol Hill, I usually arrive via Union Station. It’s a really beautiful building and one of the few grand train stations left in the country, and I’m always impressed by the architecture there. According to the architectural history, it was designed in the Beaux-Arts Style and meant to mimic the Roman Baths of Caraculla and Diocletian. It was completed in 1907, and then restored from 1986-1988 (and it’s actually being worked on right now, too). But wait! There’s geology involved with all that history. Inside the station, one of the most striking features aside from the statuary and the gilded ceilings (yes, real gilding) are the floors. The beautiful spiral stairs, where everyone stops to take photos, and with good reason! All of it is full of what appear to be calcite- or quartz-filled veins, some of them offset by tiny faults (and some filling what might be tension gashes). Veins in the marble. Note the faulting (maybe right-lateral?) next to my toes. Basically, what we had was a shallow sea (where you get lots of carbonate minerals depositing) that was then metamorphosed in the collision of a volcanic island arc with North America around 450 million years ago (the Ordovician). Here’s a nice summary figure from the USGS: The marbles formed from the low-grade metamorphism of the “carbonate banks” that built up in the shallow seas. 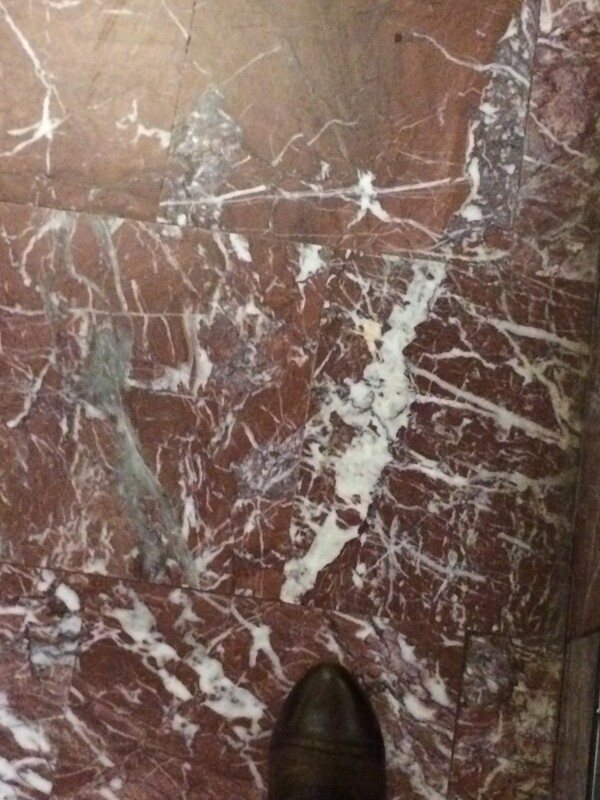 I would guess that the red color of the marbles in Union Station is from iron oxide, although I’m not a metamorphic petrologist and it might be something else. There you have it: Union Station, built to resemble a 2000-year-old Roman bathhouse and floored with marble that formed in a collision of a volcanic island arc 450 million years ago. That’s a lot of history!